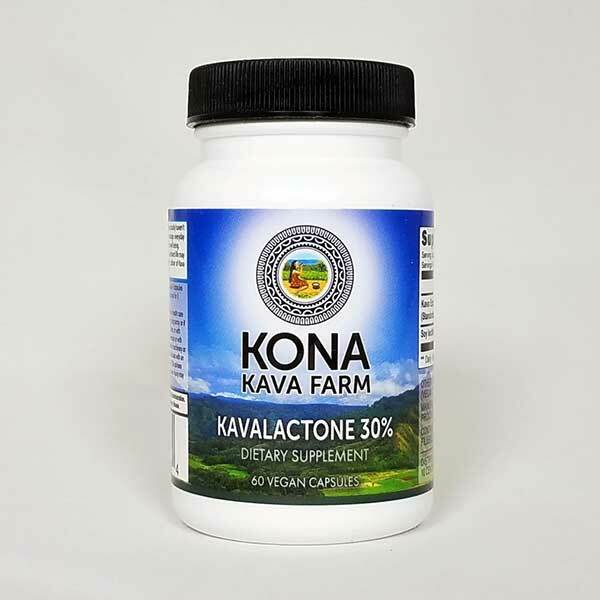 These Kavalactone 30% Capsules are packed with concentrated kavalactone extract that lets you enjoy the stress-fighting benefits of kava without the time and hassle of making drinks. 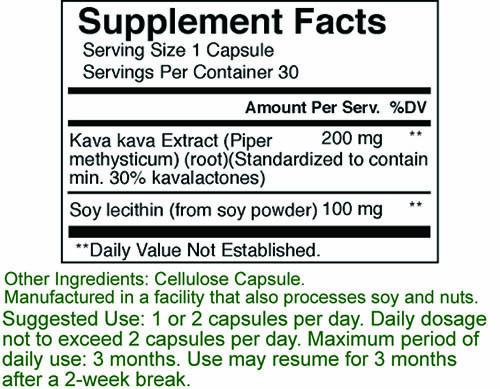 60 Capsules $23.99 60 Capsules 23.99 Kava Points. 120 Capsules $44.99 120 Capsules 44.99 Kava Points. One of our most popular products, these kavalactone capsules may naturally promote relaxation and help ease the mind from daily stress. * We use only organic, blended Kava Kava roots from the uniquely potent 4-2-6 or 2-4-3 Noble-only ‘Awa (Kava) plants. 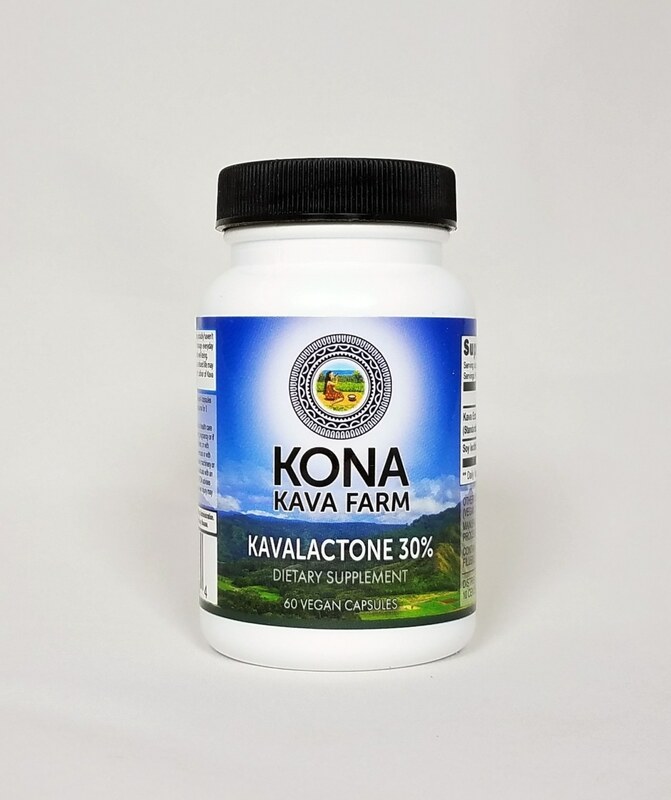 Kona Kava Farm takes great pride in every herbal supplement we offer. Hand-crafted in small batches. Infused with pure passion. These Kavalactone 30% Capsules can be used both as a way to relax and melt stress away, as well as the perfect aid in helping you get restful sleep. Instead of making you sleepy, these Kavalactone 30% Capsules help you relax, to get into the perfect state to fight off insomnia, and drift into a restful sleep. Choose 60 or 120 capsules from the dropdown options menu above. Directions: 1 or 2 capsules per day. Daily dosage not to exceed 2 capsules per day. Maximum period of daily use: 3 months. Use may resume for 3 months after a 2-week break. Caution: If using prescription medications, seek the advice of a health care professional before using this product. Not to be taken during pregnancy or if breastfeeding. Not for use by persons under the age of 18 years or with alcoholic beverages. Keep out of reach of children. Used in excess or with substances that induce drowsiness, the ability to operate heavy equipment or a vehicle may be impaired. Not recommended for use by individuals with an existing liver condition or those at risk of developing one. I have been taking just one of these each night at bedtime and it has helped so much with calming me to sleep better and in calming my legs from moving all over the place. I also don’t wake up in pain like I was prior to starting these from my Fibro and arthritis. Thank you so much for such a great product! I always used to write my dreams down, studied Jung etc. However since an operation , and the accompanying pain meds I stopped dreaming altogether. Drugged sleep is better than no sleep at all , but…. not very restful. Just ordered. I hope great quality. Been on pain meds and klonopin for years. Found basement shaman awesome powder but need capsules for convenience. This is third vendor trying. Last one capsules were weak. Will let everyone knows how these are. but pain and anxiety kept me running for the Tramadol. The bad news is Tramadol makes you stupid and forgetful to an embarrassing degree. The surgeon had told me not to take ibuprofen as it impedes bone healing…however you have to take something for pain…? This bottle of Kava capsules , two at a time , has relaxed me and stopped the ache. What a blessing … thankyou God and Kava.com. !!!!! And furthermore it seems to motivate me to DO things instead of just sitting in front of the TV. These capsules are great if you’re on the go or need anxiety relief when you’re at work or school. I’ve found that three capsules is the most notably effective dose for me. This is the first Kava I have tried. It’s perfect for what I want. Relaxing me and yet I can still function clearly and keep working. Great product for stress!